I've always wanted to embark on an autumn adventure, but it usually takes us 'til March to make a plan. Until now. This November, Porter and I are heading to...Prague!!! We're still deciding whether we should explore the Czech countryside or just pop to Berlin. Suggestions for shops, restaurants and day trips would be so welcome! It's gonna be tough to top Istanbul, but if nothing else, the photo opps will be great and we'll have plenty of pilsner to fuel our antics. YAY!! SOOOOOOOOOOOOOO EXCITED!!!!! Can you tell?!!!!!! I've only been out of the country three times. And all three times were to Prague. It's THAT GOOD. Great idea! Might want to take some Kafka to read in transit, just to create the right mental state, maybe "A Visit To A Mine" or "Reflections For Gentlemen Jockeys". Such funny timing! I was just talking to someone about my trip to Prague a few years ago! You're going to LOVE it! It's so beautiful! I will put together a list of things to do and places to go and send it to you. It's a small city so you really only need two to three days to see everything so I would recommend Berlin too. I just read a few articles on Berlin so I'll try to find those too. When are you going? Heather -- that would be amazing!!! We'll be there November 2-8.
how exciting!!!!!!!!! if you go to berlin, i will write you a little sheet of recommendations -- it's the BEST CITY EVER. amazing food, soooo fun and cool, you can bike everywhere. I would love to go there two! Prague is beautiful. I was there once, on an infernal business trip that despite the use of a private jet was bitter and evil. Even so, Prague was beautiful. I went to the most perfect wedding in Prague...but I have to admit it was mostly a blur and I couldn't tell you one place I went! Except for the beautiful riverside restaurant that the reception was in...whatever that was called. If you're interested in seeing a smaller city, Karlovy Vary seems like it would be right up your alley. And don't forget the Kundera. Ahh sounds dreamy, lucky you. Even luckier with all these tips from blog friends. I have always wanted to go to Prague! Hope you have a great time! Prague may be small but I would spend the entire time in and around the city, it is that great. My husband & I loved it so we went twice. Do Berlin another time. You should do a day trip to "Kutna Hora" and another day trip to "Karlovy Vary". And czech out (sorry) the puppet theatres, but purchase Jiri Trnka videos before you go. Find the Mucha museum. Eat the little flat cakes from street vendors - I wish I could remember what they're called. Buy garnets cheaply! Oooo that sounds so exciting! I've just gotten back from Berlin and if you're into partying and clubbing - it the best place on earth.. but if not, honestly, it's my least favourite place I've ever traveled to. The peolpe are nasty, the city is hideous and uninviting. Unless I'm going on a party weekend, I'd never go back to Berlin. I've seen photos of the Czech countryside though and its genuinely just so gorgeous. Great photo op! What ever you decide, HAVE FUN! The key to Prague: walking everywhere. My favorite and most unusual and only-in-Prague site is the St Vitus chapel in the Cathedral. The walls, dimly lit, are covered in panels of 'precious' stones (most actually agate but very beautiful). It's eccentric and wonderful. You'll see the clock near the central square. 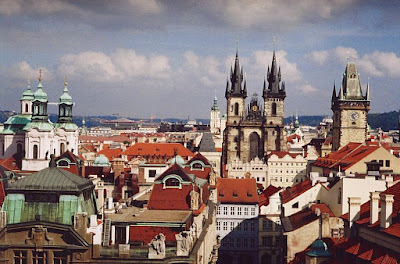 You must climb up the tower on the Charles bridge-for the best view of architecture and setting. Your timing is good: I may be chilly but you'll avoid swarms of summer tourists. Immerse yourself in Prague--then go to Berlin another time. Not sure how far Karlovy Vary (otherwise known as Karlsbad) is but it really is stunning - a baroque style spa town with crumbling mansions. Cesky Krumlov is possible as a daytrip from Prague. It has a beautiful castle and library and is on the river. Definitely worth a visit. Oh and the decorative arts museum in Prague is really good too. Love your blog - it really stands out. Not sure of what your travel requirements are but if simple, 16th century place in the center of town with hand painted ceilings works for you, you'll love it. My wife is from Prague and the group is run by my brother-in-law, Pavel Hejcman (Hates-mahn). Ask specifically about the place I mentioned above. He is a very good guy, will pick you up at the airport, and point you in the right direction. Kutna Hora is only about an hour bus ride and worth it for the "Bone Church" alone! Prague is my most favorite city!